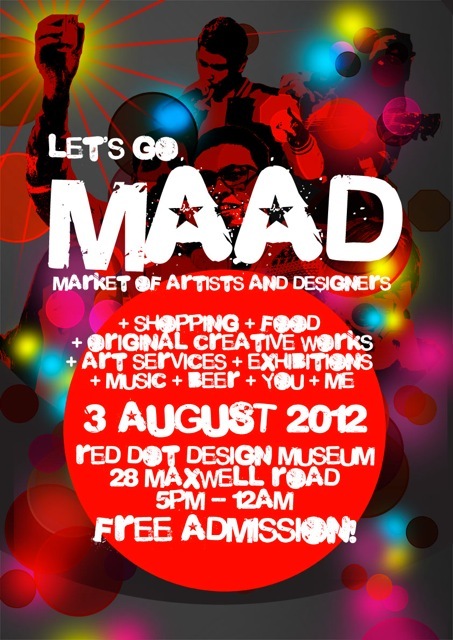 Our first MAAD flea at Red Dot Museum tomrorow! We heard that's live band, yummilicious finger food, beer and bursting with tons of creativity by the various local creative people. Drop by to view our new DUSK Jewelry creations. We'll love to get to know you better also! Join us tomorrow, 3rd August 2012 @ the party where local design and artistic community gather to celebrate new beginnings, good design and awesome music. Live Music + Beer + Late Night Shopping + all things awesome + You + Me = MAAD. A new exhibition unveils too this 3rd August in tandem with MAAD [Market of Artists and Designers].